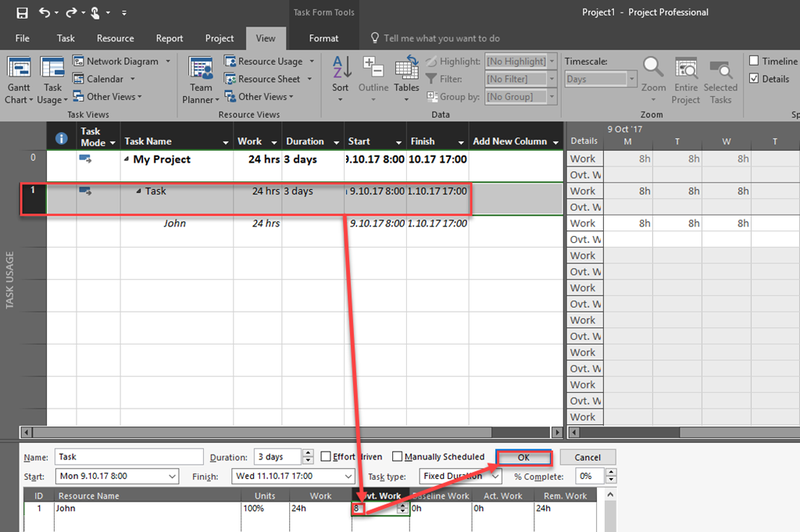 ← Overtime work at specific day–is it possible in MS PROJECT 2016? 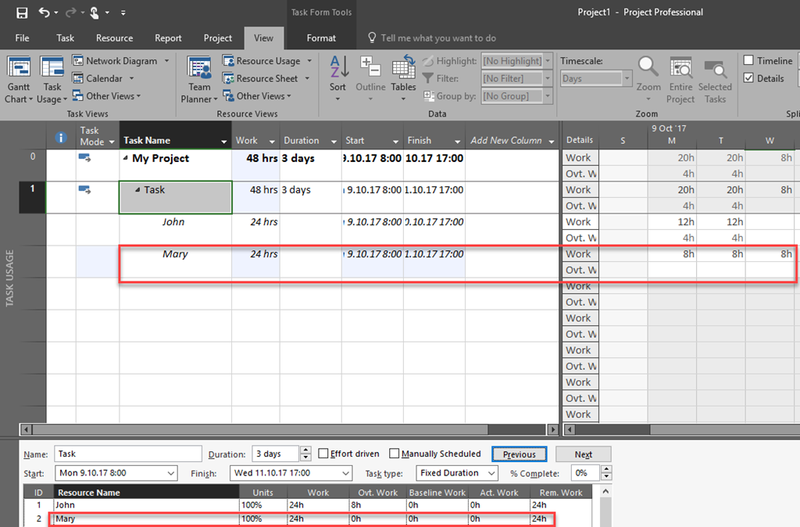 today I’m going to show relation between Fixed Duration Task Type, and Overtime Work in MS PROJECT 2016. As you can see on the right part of this View, I’ve added Ovt. Work. If you do not know how to get it it is described in my post from 10/7/2017. Why 12 hours/day? 24 hours of total work – 8 hours of overtime work is 16 hours. 16 hours divided by 8 hours regular work per day is 2 days. And John will work 8 hours each day (regular work) and (8 hours of total overtime / 2 days) = 4 overtime hours per day. So, 8 + 4 = 12. 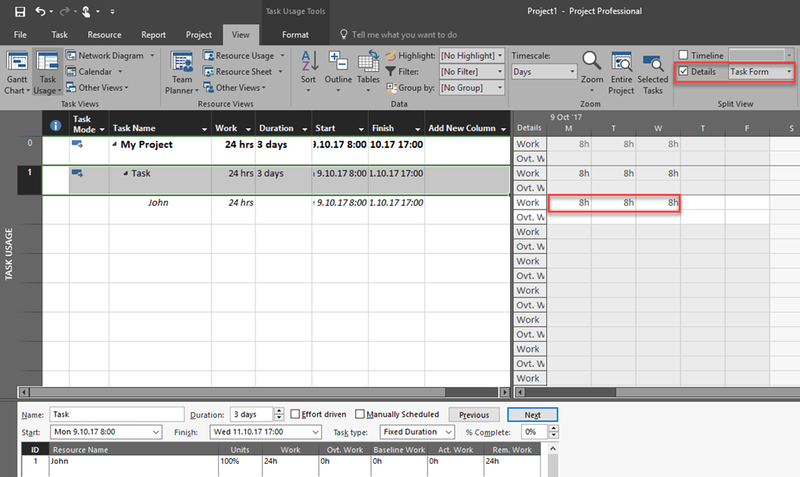 Since I have Fixed Duration = 3 days, MS PROJECT knows that Mary should work three days, and those 24 hours are divided in those three days. If duration was changed to two days after I put Overtime Work for John, Mary will have to work only 16 hours, and that is not correct, because I have 3 day Fixed Duration Task. Keep that in mind before you think that that this is bug! This entry was posted in Micsrosoft Project 2016, MS PROJECT 2016, PRoject Management, Uncategorized and tagged Micorosft Project 2016, Micorosft Project 2016 - Overtime Work. Bookmark the permalink.